Since the 1990's, I have enjoyed being a full-time artist working in fabric and paper collage and paint. I love the fun, challenge and adventure of creating brightly colored, intricate landscapes. Using collage and faux painting techniques, I have also made custom floor cloths, table runners, and placemats. To share my techniques, I enjoy leading workshops in these areas. I have had several solo shows including exhibits at the Flat Iron Gallery, Peekskill, NY, 2012, the Gallery at Teatown Lake Reservation, Ossining, NY 2012, ASK Art, Kingston, NY 2009, Woodstock Artists Association and Museum, 2005. I have participated in three person shows at Rockwell Art Gallery, Wilton, Ct, 2011, Woodstock Artists Association and Museum, Woodstock, NY, 2006, and Atrium Gallery, at Helen Hayes Hospital, Havershaw, NY, 2006. Some of the juried group shows include Red Eft Gallery fiber art show, Wurtsboro, NY, 2007, and fine art and craft shows in Ft. Washington, PA, Lyndhurst in Tarrytown, NY, Flemington, NJ, and Rhinebeck, NY. In the magazine, Cloth, Paper & Scissors, an article about my work appeared in 2008, my fabric collage, Wild Tulips, was featured in their 2010 calendar for May, and my mixed media collage, Mountainville, was featured in September, 2011. Two of my collages, From the Mists of Avalon and Dawn were published in a children's art textbook, Perfect Match, in Singapore in 2010. As a participating artist of Free Art in New York, a short video about me and my work may be viewed at Free Art in New York. In 2014, my fabric collage, Red Sunflowers, was chosen to be part of the Beekman Street Banner series. The banner depicting my artwork stands 13' high by 4' wide on Beekman Street in Beacon, NY. 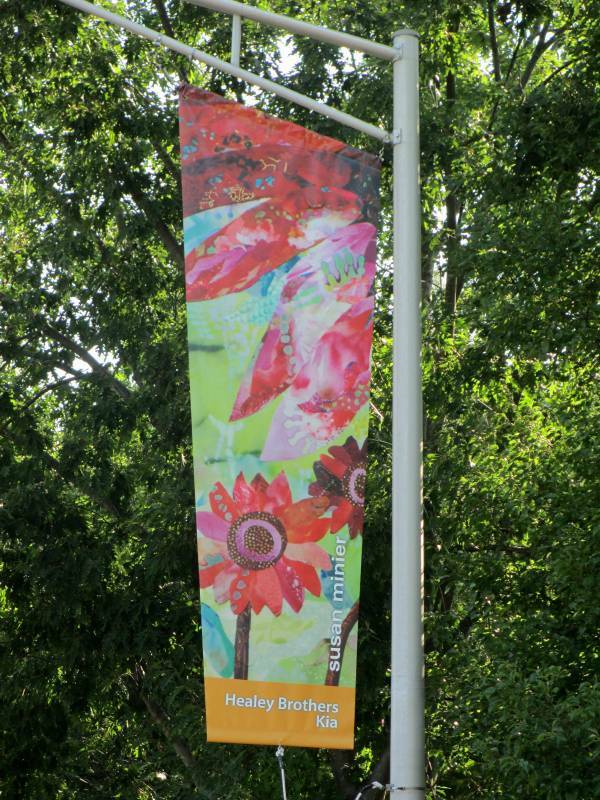 Banner on Beekman Street, Beacon, NY displaying my "Red Sunflowers" collage.